This is a book which I read about 6 years ago and have never forgotten. It is written in sepia tones, much like "A Tree Grows In Brooklyn." And, just as in that novel, this book examines the coming of age in the life of a young girl within a distinctly ethnic environment. During the early 1900's, through to the 1970's, there was, in almost every southern town of account, a store which sold all manner of dry goods. This could range from school clothes to kitchen appliances. They were like little Macy's. They were also almost always owned by Jews. Ms. Suberman has penned a wonderful memoir of that time and place. The author has placed her memoir in the fictiously named town of Concordia, Tennessee. I'm not sure why she did this, as the book is wonderfully written and the characters drawn with complete reality. These are people we have all met at one time or another. Some are good, and some are bad. Life is like that. The book is, in large part, devoted to the history of her ever optimistic father, Aaron Bronson. As a Russian immigrant at the turn of the century, living in New York, he decides to take a chance and go further inland to see what this New World holds in store for him. Originally a salesman, he decides to start a store in one of the towns that he passes through. The author recounts how her father obtained a lease on a store, which he proudly named "Bronsons Low Priced Store", and his dealings with people who did not want the Bronson family in their community. The store becomes a family affair, with both the mother and 3 children participating in the daily operations. There are the usual cast of characters in town, some of whom come to accept the Bronson family as one of their own. There are also the bigots, who do anything they can to make life just a bit harder for Mr. Bronson. But, with his ever present optimism, Mr. Bronson overcomes all odds to become a permanent fixture in Concordia. The book also explores the relationships of the 3 children and their mother as they struggle to adapt in a town where they are the only Jews. With the older son's Bar Mitzvah approaching, he is forced back east to study his Hebrew for the big day. His sisters also have their share of problems, as they struggle with bobbed hair and gentile boyfriends, in a Jewish home, much to their mother's dismay. There are also kind hearted neighbors, like Miss Brookie, who helps the family through their transition into becoming Southerners. The book takes place during the heady days of the 1920's and the lowest points of the Great Depression, during the 1930's, when the town almost went bankrupt. Only a Town Auction would save the day. I will not spoil this portion of the book for you. 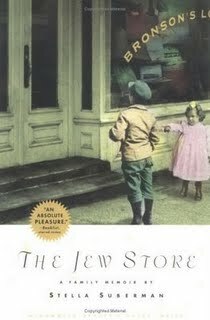 The book not only chronicles the story of the "Jew Stores" that dotted America during the first half of the 20th Century, but also the people and the towns in which they were located. These stores were often the first encounter that many Americans had with people of the Jewish faith. It is also the story of a group of immigrants looking to assimilate into a new land.